Have you prepared your Black Friday Shopping Lists? Sears and Kmart want you to get big savings and an early start. Check out the special offers and deals at these two stores. Check out these Member only Deals. 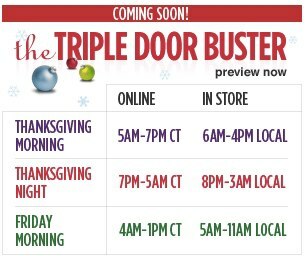 Sears has over 1,000 Door busters this year starting online at www.sears.com Wednesday, November 21st at 8 p.m. CT.
On 'Black Friday' morning, Door busters start at 4 a.m. Online and 5 a.m. (local) in-store.